Bush Declares 'Mission Accomplished' — Paolo M. Mottola Jr.
W. delivered a speech yesterday reassuring Americans that we will be victorious in Iraq, as we embark into the fourth year of the war. "We are implementing a strategy that will lead to victory in Iraq and a victory in Iraq will make this country more secure and will help lay the foundation of peace for generations to come," W. said. 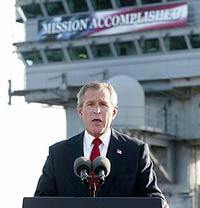 This statement comes 1,054 days since W's May 1, 2003, "Mission Accomplished" speech/photo-op aboard the USS Abraham Lincoln. Yikes.